My extended family and I spent Thanksgiving week in Sedona, Arizona, enjoying the spectacular beauty of the red rocks. We went to the old mining town of Jerome; we took a Pink Jeep Tour up in to the higher elevations; we saw the Chapel of the Holy Cross; we climbed up into Cathedral Rock. Each day was full of beauty, exercise, laughter, good food, and new experiences. Before we left for vacation, we all agreed that we needed to set aside a day to take the 2-hour drive north to the Grand Canyon. Only one of us had ever been there, and we were all eager to go. When we arrived at the Canyon visitor center, we spent some time talking with one of the experienced volunteers, to find out which trail was best to take with the time we had available. We also wanted to include time for lunch. First, we took the shuttle bus to El Tovar Restaurant – a beautiful, 100-year-old restaurant and hotel – right on the rim of the Grand Canyon. We enjoyed a lovely lunch sitting next to a window overlooking the Canyon. After lunch, we took the shuttle back to the Visitor Center, and awaited a different shuttle to take us to the South Kaibab Trail. It was quite cold that day, so we were bundled up with winter jackets, hats, boots, gloves. When we arrived at the trail, the first thing that we saw was a sign saying: Trail is icy – crampons recommended. My heart skipped a beat, but I saw people heading toward the trail who didn’t have crampons – so I joined in step with my family and off we went. The view from the top of the trail – like every other outlook we saw – was beyond description. The Grand Canyon is so vast, and so deep, that it seems almost unreal. The color variations on the thousands of layers of rock are indescribable. It is breathtaking – literally. As we entered the trail, it became clear right away that it was a series of switchbacks – about 4 feet wide at any given point; no guard rails, no hand-holds; just sheer beauty and staggering openness. At this point in my story, it is important to say that I feel very scared and shaky at high elevations. My feet and legs immediately feel tingly and weak, and I feel like I’m fighting an irresistible urge to jump. As I entered the trail, I was aware that this was more than a challenge to my fear of heights – but, after all, this was the GRAND CANYON! Others in my family struggle with heights as well, so we walked near each other – taking our time, often crouching to hold on to the rock as we turned a sharp corner, or had to pass others on the trail. 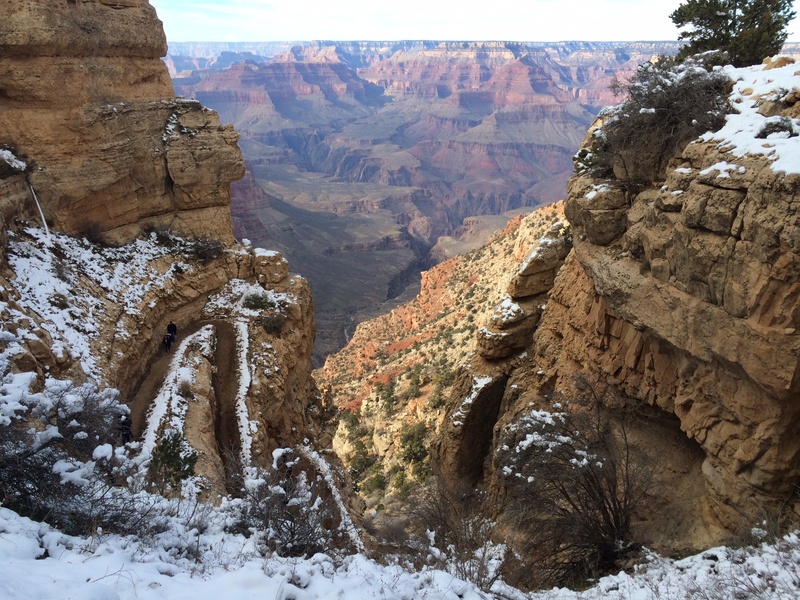 As we continued downward on the trail (my hands are clammy just writing this), I became aware that I was unable to look out toward the Canyon – I just had to keep my head down and stay focused on the trail. We had agreed to meet up, with the family members who were walking faster, at a place in the trail called Ooh Ahh Point. After about 30 minutes of walking, we approached Ooh Ahh Point, and I realized I was in trouble. I could no longer look up to see anyone; I could no longer imagine walking another step; I could not pose for a picture or even talk. I was completely and utterly paralyzed with fear, and tears began streaming down my face. I had reached a place in myself where I felt frozen and unreachable, and all I wanted was to be air-lifted out. With a forceful urgency that arose out of my terror, I began to walk back up the trail. I wanted only to get out and I couldn’t wait for any person, or any conversation, or any decision. I just started. Right away, I was aware that my husband was behind me – staying at enough distance to give me space to move, but close enough for me to know he was there. I was aware that someone else was following as well – it turned out to be my daughter. The trail is on an incline – steep in some places, almost level in other places. I stayed to the inside as much as I could, passing others coming down. I couldn’t look up – just kept my eyes on the trail in front of me. At one point, my husband asked if we could stop – he was struggling to catch his breath. I was oblivious to my own breath, my own pace – just aware of the urgency to get out. By the time we got back to the shuttle stop at the top of the trail, I was done in. Physically exhausted, emotionally spent, and spiritually empty. Eventually, the rest of the family joined me, we got back on the shuttle, returned to our cars, and headed back to Sedona. In the quiet (and safety) of the car ride, I began to unwind and unravel my experience. What was my deepest challenge? My deepest fear? In the growing darkness of the day, I came to know – it was a fear of limitation. This fear – this awareness of the power of limitation – has become part of my prayer. What does it mean to feel limited? How does that influence my life with others? My life with God? What is it I pray for in the midst? My family has asked me: if we went to the Grand Canyon again, what would I do? At this moment in time, my answer is – and has been – I’d do the same thing. The South Kaibab Trail taught me a new way to pray. That took an amazing amount of courage, going into the hike knowing your fears and going anyway. It brings to mind an experience I had in a church in Munich where you could go to a balcony. Well, the stairway was open and you could see through the stairs and all the way down. I completely froze. I had heard the expression and that day I experienced it. It took all I had to get back down. The next three days my leg muscles were horribly sore. I wondered if you were sore from the fear also. That frozen feeling is awful! Thanks for sharing that great story.